Nakoa is both arctic and timber wolf who was born in 2006. He is an impressive, large, pure wolf with giant paws and loves attention. Nakoa is affectionately known as our "gentle giant" and is typically the first wolf new animal caretakers are introduced to when learning how to interact with wolves due to his calm demeanor. He was the alpha male in our main pack for over six years until dropping back to the beta in the winter of 2012. Nakoa is a bird watcher and spends hours watching the many birds in his heavily wooded enclosure. Our papa wolf who fathered three of our wolf residents, loves fish. Thanks to Morrisville State College and their aquaculture program, sometimes trout end up on the dinner menu. Nakoa's howling sends his "I'm here" message out to the valley below and the distant hills. We have had people more than eight miles away hear the wolves howling under the right conditions. Tashina means "beauty of the mountain" and she is indeed a beautiful female gray wolf. Born in 2008 in a natural den right here at The Wolf Mountain Nature Center, she has been a joy to work with. Always on the go with high energy, Tashina is an excellent hunter; catching birds, snakes, red squirrels, mice, moles, and voles which she does not share. She is very photogenic and offers excellent photo opportunities, except in late spring/early summer when she sheds an abundance of fur and her tail looks more like that of a possum! These "bad hair days" will give way to a gorgeous new coat. Due to some "inter-tribal warfare", Tashina has been relocated to a new enclosure with a young male wolf, Nipahwi. Tashina is especially happy and playful when it is bitter cold and the snow is deep! "Turtle", as we call him, is named in honor of Raymond Dancing Turtle who made the journey several years ago. Ray dearly loved coming to see the wolves and even with his failing health, he managed to walk to the fence and greet the wolves. When Natani gave birth to one male pup in 2008, we decided that he would be called Dancing Turtle in honor of Ray. Turtle is a large,intelligent and impressive animal weighing about 140 lbs in the winter. Dancing Turtle is now the dominant male in the main pack and he requires that care-takers check in with him for permission before entering the enclosure. He is watchful of his surroundings and always aware of the location of other pack members. One of his favorite things to do is jump for apples. As soon as the apples are "close enough" to being ready to eat, he is jumping up and picking his own. If he cannot reach them, he has been known to shake them lose by pulling on the branches and sometimes doing a little tree trimming by removing entire branches! Tala, an Alaskan/Arctic wolf, likes to sing, has an amazing howl and tends to whimper, wine and vocalize constantly. She has been very vocal from birth. This large 120 pound dominate female with enormous feet was born in 2008 in a natural den here at the Center along with her sister Tashina and brother Dancing Turtle. Tala does not do well with other female wolves as she is extremely adversarial and territorial. This is a behavior that commonly happens in captivity more so than in the wild, and it is our duty to see to it that the animals are paired in situations that are in their best interest physically, emotionally and socially. Tala lives in a 3 acre enclosure with a younger male tundra wolf named Tamarack; the two are great companions and are often seen playing together. Seneca is a very impressive black phase Timber wolf born in 2011. 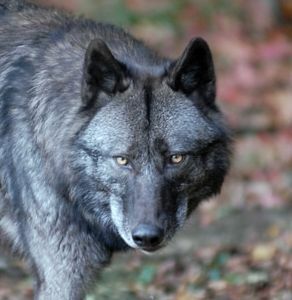 Black phase Timber wolves are generally native to areas such as British Columbia, southern Canada, interior Alaska and are common in Yellowstone. In the past, these animals would feed on migrating salmon in the clean, cold waters. Unfortunately, humans have come along, damned and altered the rivers, built settlements, and many water ways have been polluted by paper mills, mining, gas and oil operations. This has taken away an important cultural food for many animals. This is indeed a cultural loss for these wolves. Seneca is easy to distinguish from his brother, Cayuga, as his fur has "white frost" in places. Seneca & his brother came to the center at only a few weeks old, thus allowing us the opportunity to social them with people. Several years ago Seneca and his litter mate brother, Cayuga had to be removed from the main pack due to incompatibility issues. Both now reside in the three acre wooded enclosure. Cayuga is Seneca's brother, also a black phase Timber wolf born in spring of 2011. Although he was socialized with people from a very young age, Cayuga is still much more wary of people than his more outgoing brother. Cayuga loves to post himself as sentry atop of the lean-to structure in their shared enclosure and is constantly alert to everything happening around the center. 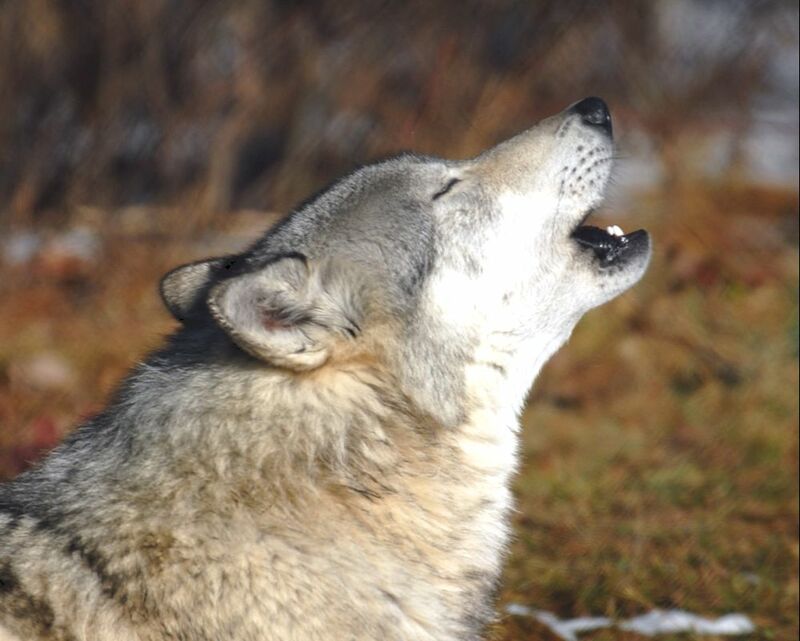 Cayuga loves to howl and is usually one of the first and last howling during a pack howl! Cayuga's eyes are stunning and visitors often comment on how intense they look. Cayuga is clearly the dominant of the two and around breeding season they generally have to "discuss" that issue again. Along with his brother Seneca, these guys absolutely love apples; in winter, we sometimes get a bag of apples from the store as a treat, (they like Fuji best)! ​Tamarack, an Alaskan Tundra wolf, was born in the spring of 2015. He and his sister, Dyani, arrived at the center at three weeks of age. He has an exuberant personality and loves attention from wolves and caretakers alike. He can often be seen prancing around with a stick or snake in his jaws. He loves to paw gently at caretakers for attention and often throws himself on the ground hoping for a belly rub! Tamarack lives with Tala, an adult female who tolerates very well his joyful energy, though at times she does discipline him with a gentle bite. He is a black phase wolf, however when sunlight hits his coat just right, he appears to be more of a brownish color. ​Dyani, meaning "deer hunter", is a black phase Alaskan Tundra wolf born in 2015, is sister to Tamarack. She resides with the Wolf Woods pack in the 9+ acre enclosure. Often not immediately visible to visitors, Dyani is usually found lurking in the shadows (and safety) of the trees or brush. She is a very tentative, cautious wolf who prefers to observe from a distance when people are nearby. To familiar caretakers, she is a sweet, loving animal. She loves playing with Okwaho & Sequoyah and is the clear leader of the group. In 2017, Dyani & Sequoyah mated and produced two offspring, a black phase male and a gray female, who both now reside at Wolf Park in Indiana. ​Okwaho, a Mohawk Indian name meaning wolf, was born in 2015 and is an Alaskan Tundra wolf. He and his brother, Sequoyah, joined us at only five days old. Okwaho, with his very tall guard hairs which stand on end, is our entertaining wolf who often follows his brother around the enclosure. He is a strong initiator of play and routinely trots around with sticks, deer legs, or other findings in his mouth in an attempt to engage the others in play. When he is tired, he literally "crashes" and sleeps so soundly that nothing can arouse him until he is ready to awaken! A beautiful animal, he is clearly the Omega in the pack; Dyani frequently chases him, especially during breeding season! Smartly, Okwaho has learned to lay low when Dyani is in one of her moods, though he will stand up to her when a deer carcass is present! ​Sequoyah, born in 2015, is an Alaskan Tundra wolf and brother to Okwaho & Nipahwi. Sequoyah is a beautiful animal whose strong personality seemed destined for alpha status. He is diligent in patrolling his 9 acre enclosure and is first to greet caretakers at fence lines or gates determining if they are "okay" to enter his territory. Sequoyah and Dyani spend lots of time together and the two mated in 2017. He has a special bond with one of our animal caretakers and has on numerous occasions brought her various "wolf gifts" such as cached food. Sequoyah loves to howl day and night; his howl is full and deep; one that touches the very depths of people's soul. ​Nipahwi was born in 2015 and is brother to Sequoyah & Okwaho. 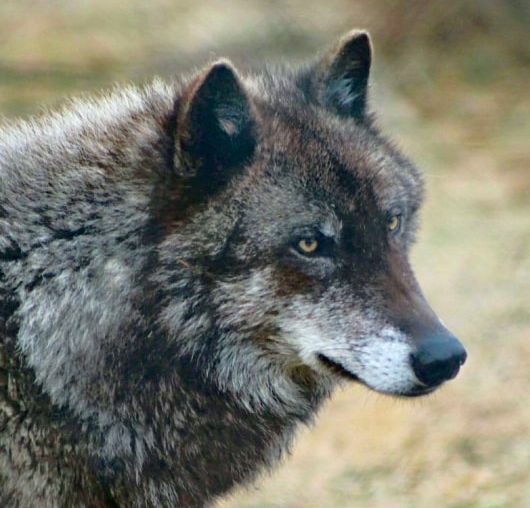 Although a litter-mate, Nipahwi didn't come to Wolf Mountain until late summer 2016 (he spent the first part of his life in other sanctuaries). Like his brothers he is an Alaskan Tundra wolf, but Nipahwi is a black phase. He is a very playful wolf who especially loves female caretakers and will literally race around his enclosure in excitement; he also adores playing with sticks. Nipahwi, along with his enclosure-mate Tashina, are usually the first wolves to greet visitors at the center as they can almost look into the windows of the Welcome Cabin! ​Cypress was born at Wolf Park in Indiana in 2017. He and his sister were swapped with pups born here at Wolf Mountain in order to introduce new blood lines into potential breeding packs. A timber wolf, Cypress is full of mischief, giving targeted caretakers a definite test whenever he can to make sure staff know the protocols when it comes to working with wolves. Once he determines a caretaker is "cool", Cypress often lays down and rolls over for his expected belly scratch. He loves to play with his sister and chases her relentlessly in a never-ending game of tag. He usually catches her and pins her down until she nibbles at him to release her; the game then starts again. Tauriel is the sister and litter mate of Cypress and born at Wolf Park in Indiana in 2017. Raised by caretakers at Wolf Park, Tauriel joined the Wolf Mountain family with her brother at about five weeks of age. Now sharing a spacious area with Cypress, she has plenty of meadows and forested areas to run and play. One of her favorite past-times is to watch wolf neighbor Dancing Turtle. Caretakers are convinced the two have a "crush" on each other as the two run and play bow to each other even though they are in separate enclosures and are eleven years apart in age. Dancing Turtle would never be able to keep up with Tauriel's boundless energy! Tauriel is like a wolf pogo stick--she jumps straight up into the air easily reaching heights of six or more feet! She is an absolute sweetheart with staff and loves to receive their affections.